Friday, the last day of the Young Mercy Leaders’ pilgrimage began with a presentation from Jeremy D. Dickey (Marketing Specialist for the Sisters of Mercy of the Americas). The title of the presentation was 'Connected Globally through Mercy' Jeremy had the full attention of the group when he announced that, not only could the participants keep their mobile/smart/iPhones on, they should take them out and hold them in their hands. 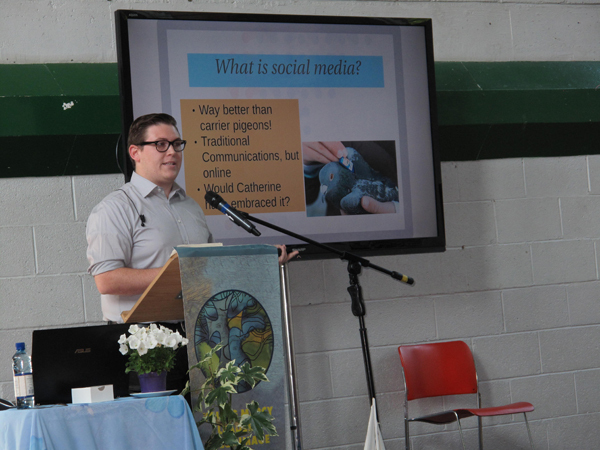 In the course of his talk Jeremy outlined how social media can be used as a tool for promoting justice and gave some examples of what had been accomplished in the area of justice by the use of social media by the Sisters of Mercy of the Americas. He reminded the group of the need to be responsible and respectful when using this powerful tool. With the aid of some volunteers he demonstrated how messages can get distorted when a message/tweet is passed along from one person to another. His presentation was followed by a discussion in delegate groups on the question: what can I do to stay connected through Mercy? A short reporting session followed. Following the morning break the various School Delegations retired to quiet spaces to do some forward planning of local initiatives to promote Mercy and Justice on their return home. The highlight of the afternoon was the final Mass celebrated by Fr. Liam Lawton. In his homily Fr. Liam described the events in his life which led to the composing of the song The Clouds’ Veil and the impact this song has made on many people who have experienced tragedy or difficulty in their lives -including the families of victims of the 9/11 bombings in New York and the 2009 bush fires in Australia. Following the Mass each participant received a decorated pebble from the opening ritual, a bookmark with a quotation from Catherine McAuley and a wish for the future from other participants. The final act of the pilgrimage was the extinguishing of the pilgrim candle by Mary Reynolds rsm. On iOS devices we recommend the Puffin Browser app which will allow you to view Flash-based content (audio, video and slideshow/ image galleries) on this website using your iPad, iPhone and iPod.